The period around 200 BCE saw the emergence of the first Japanese civilisation during the Jomon period. At this time Japanese people’s lifestyle was strongly founded on nature which people worshiped as part of their everyday life. In this era Shintoism had yet to be established, but people’s beliefs were strongly connected to nature and they believed spirits and gods exist in every element of nature. They believed herbal medicine had strong spiritual power from nature’s gods, thus they dyed and wore textiles as a part of their worship, which they believed would help defeat enemies and prevent disease. 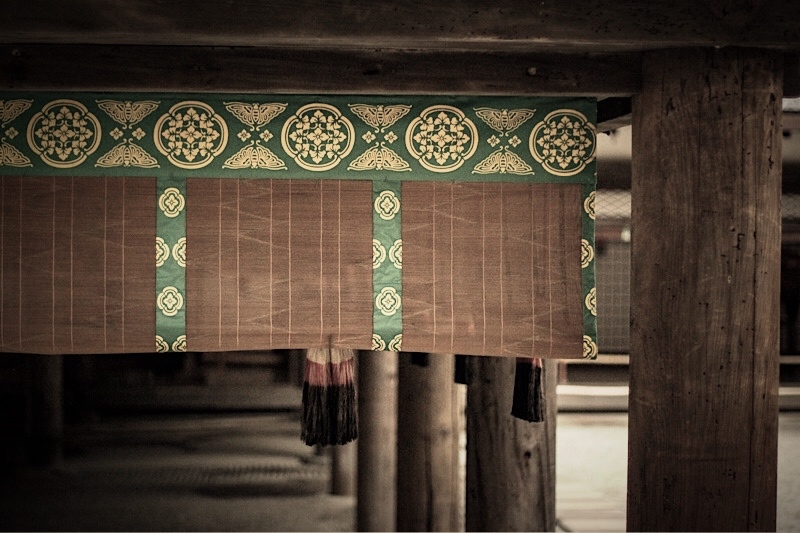 These ancient Shinto beliefs have been passed on as tradition. In 603 CE, during the mid-Asuka period (592–710 CE), “冠位十二階, kani junikai”, (a twelve level rank system), was established for the first time by Emperor Suiko. This system was adopted from a similar system in China which differentiated heredity and distinguished ranks by colour. Based on Shinto mythology, the imperial family were treated as Shinto gods, thus there were no colours allocated to them in this colour-ranking system. In 703 CE the government enacted “大宝律令, taiho ritsuryo” (code of Taiho) which re-established the class system. In these orders some of the colours were prohibited for common usage, such as the emperor’s colour – “Korozen” (dark orange or light brown), the Crown Prince’s colour – “Ohni” (orange) and other prince’s colour – “Kokimurasaki” (dark purple). White was the colour of gods and a symbol of purity and the sacred. Thus white was also the colour for the Emperor and imperial princes. Also the dye for these prohibited colours was very expensive due to scarcity. Over time they were gradually allowed widespread usage as technological improvements created similar colours, which were named differently, so that people could use them without censure. The Heian period (794–1185 CE) is considered to be the peak of Japanese imperial court culture. During this era formal female court attire called “かさねの色目, Kasane no irome” (colour combinations) generally known as “十二単, Juni hitoe” (twelve layer robes) became popular in imperial circles. They consisted of repeated receding shapes made from differently coloured layers of silken robes worn over each other. This attire was influenced largely by court regulations that dealt with restrictions on colour combinations of dress for each season, as well as for males and females and rank and social class restrictions as outlined above. In this period only men could use Chinese script for official literature. Subsequently a new Japanese script, “Kana”, based on pronunciation, was introduced for common use and became popular for new literary genres such as essays, poems and novels. For instance, Murasaki Shikibu wrote the world’s first female novel “Genji monogatari” (The tale of Genji, 1001 CE). In it she describes the importance of colour usage for clothing within different social tiers. There are also many elegant descriptions of colours in her poems. Some ancient Japanese colours also were developed for ritual purposes and they remain current in Japanese colour meaning today. For example, in Shinto and Buddhist traditions red colours are associated closely with a few Buddhist and Shinto deities such as Fudo, Zizo, Kitsune (fox: one of the Shinto animal gods). Their statues are often decked in red clothing or painted red as a sacred colour. For ritual purposes, even in the current era, red is used as a talisman and is believed to defeat demons and malevolent spirits or disease. Deep orange was used for the ritual preserving of dead bodies. In the current era it is still used in temples and shrines to signify their sacredness, but over time the colour has oxidised in the air and become a much darker colour, closer to red. As a result the sacred bright orange originally used for ritual was replaced by red which slowly became more recognised as the sacred colour. Around the beginning of the 18th century, as the result of 100 years of peace imposed by the Edo Tokugawa government and its Samurai hierarchy system, the economy became secure and developed significantly. This allowed the merchants’ power to become stronger than the Samurai class. Cultural interests and social activities also had developed dramatically. For instance, previously tea ceremony had been only an aristocratic activity but during this era, the custom of tea drinking became popular among the general population. In 1781, as merchants became much more prevalent and the centre of Edo culture, the Edo government enacted the Kansei Reforms. These were intended to solve the financial problems of the nobility and prohibited any kind of showy, fancy objects or even bright colours. These political edicts continued for 12 years. Simultaneously, the reforms provoked a broader cultural shift. Common people had only been allowed to use grey, blue and brown shades. However, during this Reform, these neutral colours and their names developed dramatically, such as the term brown, “cha-iro” – “tea-colour”. They are middle shades rather than light and vivid and considered a sophisticated colour in cultural activities such as in Kabuki theatre, ukiyo-e images and highly developed aesthetic ideology. Historically, Japan traded with only China and Holland with very restricted conditions until the Meiji restoration in 1868. As a consequence, Japan developed its own distinctive aesthetic traditions and cultures. When the Edo government ended and its power shifted to the Emperor’s faction, Japan was forced to open to foreign trading with America, England and France. From this period modernisation flooded into Japan with many aspects of European/Western cultures, including their expanded colour vocabularies. Then after WWII many colours and colour names were adopted as loanwords from English or other languages. In fact, within traditional Japanese colour dictionaries, some colours developed during the Meiji period, after modernisation, were added to the traditional Japanese colour classifications. This may be seen as an inappropriate decision concerning the meaning of “tradition”. According to some Japanese colour dictionaries, most traditional colours were established between the Heian period in the 7th century to the Edo period in the 19th century.